I have thousands of photos in my PCs and CDs. 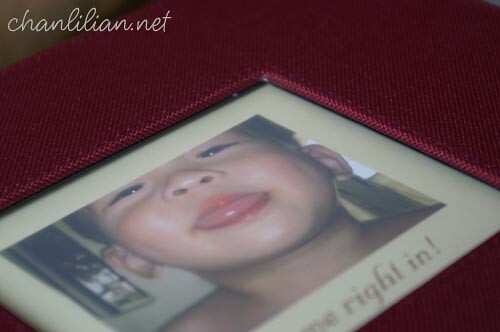 Though it is convenient and saves space to keep them there, somehow, the special warmth associated with photo albums of the olden days is not there. You can’t show your visitors, relatives, friends the photos without dragging them to the nearest PC. I like the convenience of putting into their hands an album filled with pages of specially selected photos. They can browse through them from the comfort of their sofa. They can flip the pages over and over again, pausing to enjoy each one of them. No meddling with cold machines and unfriendly keyboards. PIXART it. You get a luxuriously bound photobook with a see-through window. It is filled with pages of your specially selected photos printed in high resolution colours and produced in good quality papers. You don’t have to worry about tiny fingerprints on the photo. Nor creases. Or colour changing. I can create a storybook with it. I have the freedom to pick and choose the photos I want from the convenience of my home PC. There are spaces for me to write down caption or even a whole story behind the photo. From mere pieces of photos, I can compose themes with them. 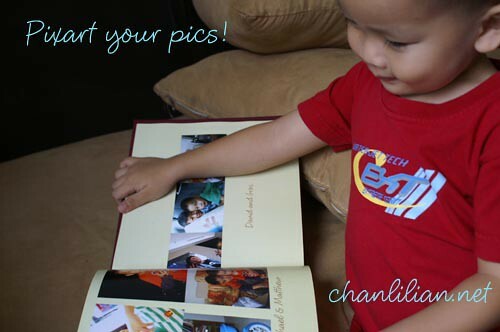 Some of the things that we can play around with PIXART are babies stories, family theme, weddings, graduation etc. Therefore, in the years to come, we will probably have a book for each major event in our life. We do not have to worry about corrupted PC or scratch CD roms. Companies in the US are offering services like these. I believe PIXART is the few who offers this service in Malaysia. It is the latest method in storing photos. With the current trend in owning digital cameras, almost everyone has plenty of photos of treasured memories. What better way than to immortalised these photos in a unique way like PIXART photobook. You can make collages with the photos. Big ones, small ones. Entirely up to your creativity. I do not mind paying for the album because a lot of time, effort and money have been put into taking the photos. Storing them on CD roms, PCs and online will not do justice to the many wonderful photos of the children in their growing up years. How do I find PIXART? James told me they are looking for someone to review the photobook. I decided to give it a try and got connected to Dominic and his team of helpful staffs. Being in another state (Penang) is not a problem at all because everything is done online. 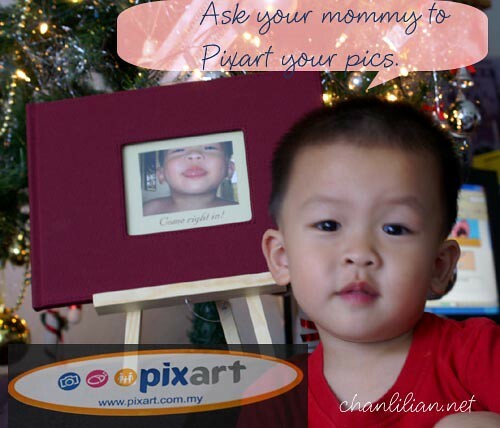 You just download the software from Pixart, play around with it, send your completed photo book to Pixart and pay online (mine is free). I must say that I am pretty impressed with Pixart’s service because I almost gave up on this project. I had some problems with my Telekom broadband line and couldn’t send the photobook (online) after several attempts. But the staffs in Pixart work patiently with me to find the solution. When my broadband was working, it took only a matter of minutes (less than 10 minutes) to get the whole transaction done. Three days later, the postman is at my door step with this beautiful gift. This is probably the first time I have dealt with a Malaysian company doing online transaction. Bravo to Pixart for the wonderful service. Surf over to Pixart’s website and start composing your photo now. You can download the software to compose the photobook. Play around with the software and compose something personalised Then, you can easily purchase it from Pixart if you like it. It makes a wonderful gift that last and last. By LilianIn Life and rants15 Comments on Pixart your photos today! Previous Previous post: Christmas Meme for everyone, and more…. Next Next post: Is this the end of my blogging? say, how many pages are there in the photobook? Fantastic! Better than DIY! WOO HOO! simmie – It is entirely up to you. But the one I got is 20 pages. The number of photos depend on your preference. You can have big photos (lesser numbers) or lots of smaller ones. The photobook cost is on their website. mott – DIY? You mean print individually? One piece of photo, if we print using our own printer and ink is about 80 cents (not to mention the cost of buying a printer). Say 20 pages, it can takes lots of photos, the cost of printing just the photos would be around around RM30. eh..i meant DIY as in, download photos to CD, bring to shop for printing, sort out which photo to put in album etc etc… that .. most time consuming…! This is a much better way! ya this is a good tip indeed. i too had been looking around for something similiar to this. was wondering how to show my pictures if there is no computer around. also as you had stated, it will be a bit ‘mai fun’ to switch on computer at home and ask friends to look at the computer monitor. i will give it a try and see. thanks for the tip, lilian. wanna ask you something related, lilian – where do you usually send your pics for printing and how much it cost and how do i have to send them for printing? can i download the pics in floopy or CD and give to the shop for printing? for the price they mentioned @ the site ie. RM 69 for one-sided printing , what is the maximum page before they start charging for additional pages? Athene – 🙂 Not sure pulak ‘cos I did not check the cost. Tell you what, I will forward these questions to Pixart and get them to explain further. Lucia – Most photo processing shops can do it. Those older ones will send our CD rom to other place to process if they don’t have. While those new shops can do it on the spot. You can either plug your camera to their machine and print immediately (if you don’t have that many prints) or give them a CD rom. I usually photoshop the pics a bit before saving to CD and give to the shop to print. Cost is around 55-60 cents for 4R size. The photo is like the normal photo, all shiny and easy to get smeared with thumbprints. I like matt finishing but expensive. I havent done an album in eons. Must get one ASAP. Looks great. I might give it a go. Have loads and loads of digital images and as you say, I hate having to start up the computer to show them off to my friends and family. yes, helen. The one that Zara’s mama did for her is also from Pixart. I agree, it’s very nice and presentable. Worth every penny.